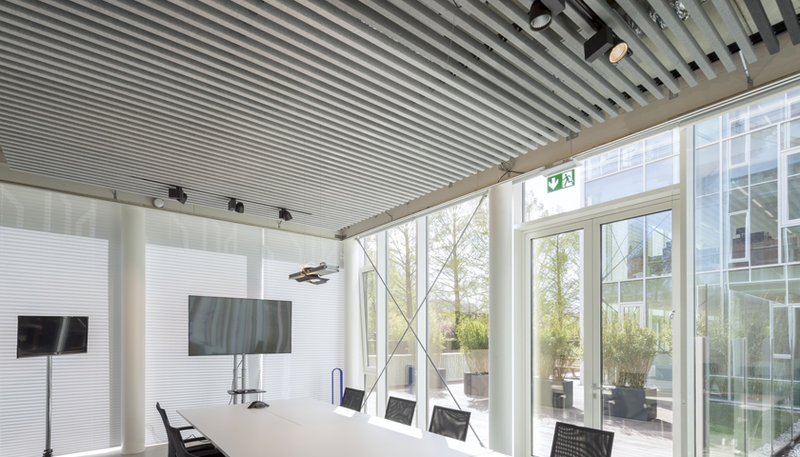 Leading architectural products company Hunter Douglas has won a prestigious international design prize for HeartFelt®, its new felt ceiling system. Beating thousands of submissions from across the world, Heartfelt®, a sustainable modular linear felt ceiling system, won the highest distinction in the category Product Design in the Red Dot Awards. The jury described it as “one of the best products of 2017” and praised its “exceptional and innovative” design. Hunter Douglas is the first manufacturer in the world to market a modular and linear felt ceiling system and manufactures HeartFelt® from cradle to cradle-certified felt. It is a natural and soft material with a warm appearance and excellent acoustic properties, which makes it an appealing choice for architects who seek sustainable solutions for their projects. It complies with regulations for use in non-polluting buildings, is resistant to dirt and dust, meets the indoor European standard EN 15251, and EN 13501 Class B, S1, d0 fire certification. The panels are manufactured using thermoformed polyester fibres, which are 100% recyclable – earning the system C2C Bronze certificate from the Cradle to Cradle Products Innovation Institute. The panels are available in up to 6m lengths and are fixed via a special carrier system. The modular system of felt panels, which is available in five shades of grey, offers designers multiple possibilities, thanks to the different options they can choose for panel size, joint width, mounting height and colour. HeartFelt® is Hunter Douglas’ answer to the growing popularity of felt among designers, who are increasingly using the material for upholstery, wall decoration and for objects such as lamps and clocks. Bjarne Hammer, of Denmark’s renowned architectural agency Schmidt Hammer Lassen Architects, helped to develop HeartFelt®. He said that as well as aesthetic qualities, felt has excellent functional qualities for interior architecture. “Felt is fantastic to work with if you’re an architect. It is a material that stirs emotions; it is warm to the touch and has an amazingly natural look and feel,” he added. It was used in the UK for the first time at the £15 million headquarters of Moneypenny, the country’s top outsourced switchboard and telephone answering service. The Red Dot Award, which goes back more than 60 years, receives thousands of submissions from all over the world. This year, it attracted more than 5,500 submissions from 54 countries and a jury of 39 independent designers, design professors and journalists evaluated every product, nominating those with a ‘groundbreaking’ design as winners of the Red Dot award: Product Design 2017. For more information on our award winning felt ceiling system please visit the Hunter Douglas website.